For a car where the only creature comfort is a very fancy ashtray, where it takes forty million years to inch up a hill as I beckon pursuing cars to be patient, and the air-con is the two front triangle windows expertly angled so the wind doesn’t make a dog’s breakfast of my hair, she doesn’t seem like much. But Daisy is perfect. 58 years and going strong, baby. When I first saw Daisy on Gumtree (of all places), I wasn’t seriously looking. 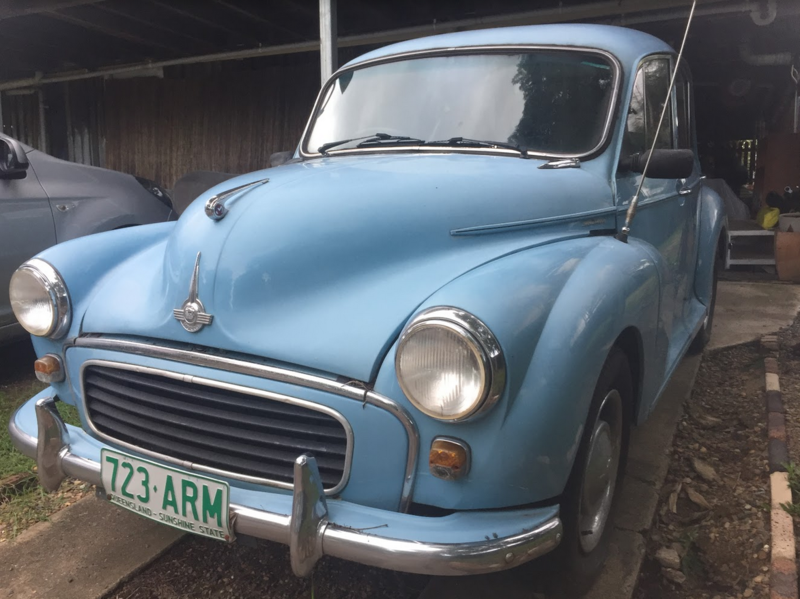 I had just typed ‘old cars’ into the search and up she – a 1958 Morris Minor 1000 – and a bunch of other old cars popped as if to say ‘we still exist, don’t be skeptical’. I casually told my family who (rightly) thought I was bonkers, but also didn’t expect me to be so serious on the ‘I want an OLD car’ thing. The family who were selling her were amazing, they let me visit twice so I could make my decision carefully, but despite her quirks, (like the fact that she doesn’t come with airbags – safety wasn’t a priority of yore) I knew if I got any other car I wouldn’t be being myself. It sealed the deal when the owner hugged me and handed me a bunch of flowers with a note that read ‘I know you’ll love Daisy as much as I did’. As we drove away I remembered I hadn’t seen how to start her – she was always on whenever I test-drove her. Isn’t she always on anyway!? No biggie, I thought to myself when I went to warm her up the next day and she sounded like a train hitting bolts. After many attempts, and with the odd bribe, I got it down pat: choke knob. Pump accelerator. Turn key. Don’t break finger. It’s a miracle when she does, as her bones can get rusty, but I think a little part of her wants to have one last hurrah. She’s a dame, after all. 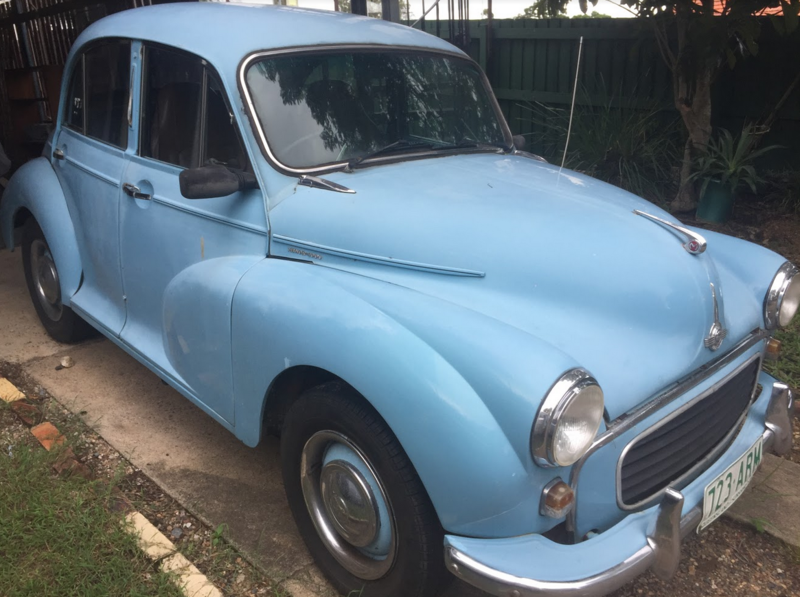 I don’t pretend to know how car parts all smash together into one tangible unicorn, but I’m going to buy myself an idiot’s guide to Morris Minors so I can change tires as foxily as Betty does in Mad Men. A small bump can flick the headlights off so the knob has to be jimmied, I had to become a maths genius to work out the speedometer conversion from miles, and if I don’t shut my door properly I have to lean over and grab it when it swings open mid-bend so I look like a madwoman at the wheel, but damn I can’t wait to drive all my drives in this lady. An old gal (or gent) isn’t for everyone, and they need extra TLC, but if it’s just you, work it. Alessia Castiglione is a copywriter and all-round aficionado of words. She pens articles for all kinds of blogs and is one half of the ad brains for her creative duo TM&AC. An admirer of people who can get through to cats, collector of too much kitchenware to count and fiercely protective over her accumulation of crystals that she started at 8, eating any food is the foundation of most of her weekends. You can find her advertising work over at TM&AC and pfaffy satirical ramblings at TBQFH.